Note: A Site Diagram is accessible. A second, borrowed Site Diagram also is accessible. 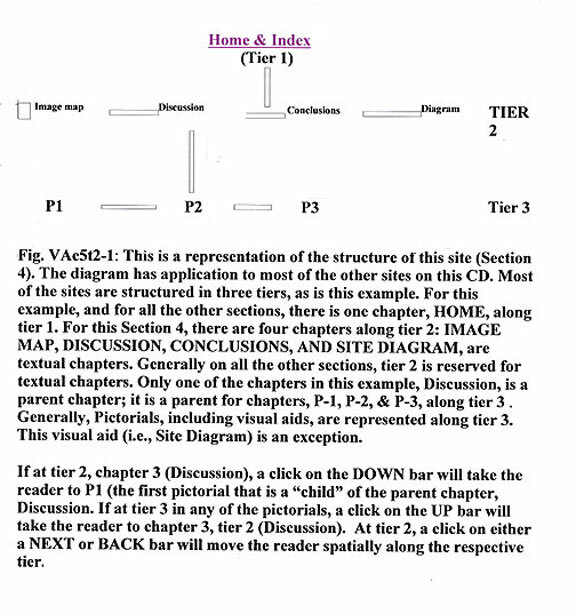 This is a two tiered section (S4) with only 3 chapters on tier 2. The three chapters are of mixed textual-pictorial character. Primary and secondary type bars are present in the Masterborder to the left and at the end of each page. Primary bars provide access to chapters of this section. Secondary bars provide access to other sections and to web sites. At the end of the page, four non-descript bars provide access to tiers and to chapters of this site (Next, Back, Up, and Down). The reader’s browser will also be an aid in moving about the Section in a temporal manner without regard to tiers. In approaching a discussion of lichenoid reactions, prejudices have influenced the author’s approach. In this approach, a lichenoid reaction is an immune assault on an epithelial structure. Classically, it is an assault on the basal unit of keratinizing epithelium, specifically the unit that is concerned with replicative functions; immunologic surveillance; maintenance of a membranous interface that is porous for metabolites but forms both a physical, and an immunologically defensive, barrier; and the provision of an open mucinous interstitium (see page3, tier2). The lichenoid reaction of the collagen-vascular diseases has certain characteristics. In characterizing the reaction it is convenient to pay close attention to the functioning units of the epidermis. Generally, the epidermis can be divided into two functioning units: the superficial unit and the basal unit (fig.1). The basal unit is primarily a reserve of cells; its response to stress is hyperplasia with proliferation of its keratinocytes. As a result, there is often an alteration of the configuration of the interface between the epidermis and the dermis. The interface takes on an undulating quality and as a consequence both the dermal papillae and rete ridges become elongated. The end result is an expansion of the interface domain; the area is expanded to compensate for the increased metabolic needs. Basal keratinocytes generally tend to be somewhat elongated in a vertical orientation and have their long axes perpendicular to the surface of the skin. They have basophilic or lavender cytoplasm and this cytoplasmic quality provides a basophilia to the basal unit which contrasts with the acidophilia of the superficial unit. Basal unit hyperplasia is a psoriasiform process. The superficial unit is composed of polygonal cells whose long axes tend to parallel the surface of the skin. These cells have acidophilic cytoplasm and this cytoplasmic quality contributes an acidophilia to the superficial unit. Keratinocytes of the superficial unit are destined to die during the process of terminal keratinization. The dying cells in synchronized steps are carried upward and contribute to the keratinized lamellae of the keratin layer. A process which damages the basal unit is likely to be associated with retarded differentiation in the superficial unit. The cells are likely to enlarge individually (they acquire more cytoplasm) and may more completely develop keratohyalin granules. The superficial unit comes to dominate the histologic picture. The type of damage to the basal unit affects the histologic picture. Well-developed lytic defects in both the basement membrane and the basal unit of the epidermis may be inlaid with fibrous tissue in a process that produces accretive fibrosis at the dermal-epidermal interface. Such a process is lichen planus-like. In some disorders, the lytic defects do not disrupt the basement membrane and dead and dying keratinocytes are carried through the superficial unit to the keratin layer in a modification of transepidermal elimination. The changes in erythema multiforme are prototypic. In the collagen vascular diseases, there is damage to the basal unit with a failure of basal keratinocytes to contribute to the basal unit. The basal unit atrophies and even basal keratinocytes may take on the qualities of the terminally differentiating cells of the superficial unit. Well- developed lytic defects usually are not a feature. The basement membrane in such a reaction early on is associated with vacuoles and may show duplications. It may be coarsened, particularly in lupus erythematosus. It is characteristic of lesions of lupus to show a straight interface between the epidermis and the dermis. In collagen-vascular diseases, the lymphocytes and histiocytes of the inflammatory infiltrates tend to be sparsely and loosely distributed at the dermal-epidermal interface (a cell-poor lichenoid reaction). Fragmented nuclei may be encountered among the intact cells at the dermal-epidermal interface. 2. telangiectasias and perivascular deposits of hyalin. 5. coarsening and duplication of basement membranes of the dermal-epidermal interface and along the follicles. 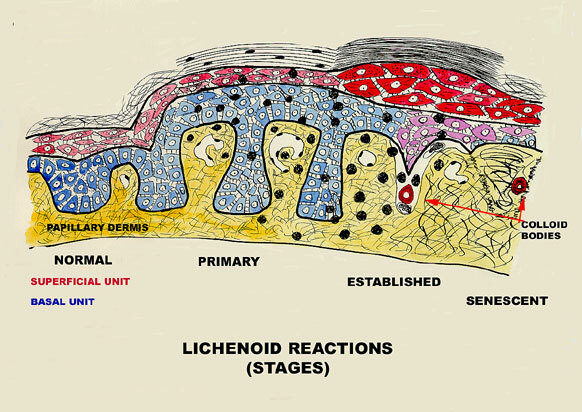 Figure 1 is a diagrammatic representation of the life-history of a lichen planus-like lichenoid reaction. It has some relevance to the lichenoid reaction of the collagen-vascular diseases. The lichenoid reaction of collagen-vascular disease is an “established” pattern with features of senescence. In contrast to the lichen planus variant, it does not produce significant lytic clefts at the dermal-epidermal interface. The process is more uniform without focal areas of more significant destruction of basal keratinocytes. In addition in contrast to the toilet of the defects in a lichen planus-like reaction, there is no fibrous inlay of the defects and no entrapment of colloid bodies in the fibrous tissue newly formed in defects. Colloid bodies are few in number in the collagen-vascular variants. There is atrophy of the basal unit and often complete effacement of rete ridges in the collagen-vascular variant. Discoid lupus erythematosus is associated with some degree of epidermal hyperplasia. It may on occasion be associated with patterns of pseudoepitheliomatous hyperplasia, particularly from follicular components. Basement membrane change is more prominent in DLE. In systemic LE, the epidermis is often atrophic (thin). Inflammation is more severe in the discoid variants. Subacute LE is an exception with a prominence of necrotic keratinocytes in the epidermis and upward migration of the necrotic cells. It shares features with graft vs. host reaction. Generally, the epidermal response in lupus erythematosus is atrophy of the basal layer and hypertrophy of the cells of the superficial unit of the epidermis. DLE involving the face may be characterized by follicular epithelial hyperplasia (pseudoepitheliomatous hyperplasia with invasion of the actinically damaged reticular dermis. The expanding follicular epithelium may crowd the surface epithelium to the point that the epidermal changes are inconspicuous and overshadowed by the follicular changes. Such a lesion may be misdiagnosed as carcinoma or as pseudoepitheliomatous hyperplasia without an appreciation for the associated cell-poor lichenoid reaction. Such lesions might be characterized as LE hypertrophicus. Mucinous changes of the reticular dermis are common in both DLE and dermatomyositis. In DLE, follicular infiltrates of lymphoid cells tend to be a prominent feature and are an aid in diagnosis. In some examples of LE, the mucinous changes in the dermis may not be associated with significant epidermal changes. Such lesions may present clinically as tumors and are sometimes characterized as LE tumidus. Is the mucin of the mucinosis of dermatomyositis less hematoxylinophilic than that of the mucinosis of LE? It may be but perhaps this impression is more indicative of differences in the character of an H & E stain from laboratory to laboratory. Rarely, morphea is associated with the epidermal changes of a lichenoid collagen-vascular reaction. Such lesions might be characterized as a form of mixed connective tissue disease. More often, lichenoid patterns which share features of LS & A are encountered in the epidermis and upper portion of the dermis in lesions of morphea. The associations are such that the LS & A changes must be characterized as a variation of morphea. The two disorders also share the qualities of a lymphohistiocytic collagenosis in the reticular dermis. In LS & A the collagenosis is at the interface between the reticular dermis and the zone of sclerosis and hyalinization in the upper portion of the dermis. In morphea, it is most characteristic as a feature of the lower portion of the reticular dermis and is instrumental in producing the substitutive fibrosis which results in the straight interface between the reticular dermis and the subcutaneous fat. In both disorders, the infiltrates of the collagenosis tend to contain plasma cells. A lymphohistiocytic collagenosis is also a feature of the deep dermal changes in lesions of lupus profundus. In LE profundus, the changes in the lower portion of the dermis take on sclerodermoid qualities with the pattern of a lymphohistiocytic collagenosis, streaked collagen bundles that are arranged parallel to the surface of the skin, and perivenous lymphohistiocytic infiltrates containing plasma cells. In addition, lymphoid cells may be found in the subendothelial space of such vessels. The changes in the fat are mucinous and sclerotic and may be associated with thrombosis of small vessels. The fibrin may organize and be transformed into hyalin. Secondary (gray) bars (black spheres) access other sections and web sites.